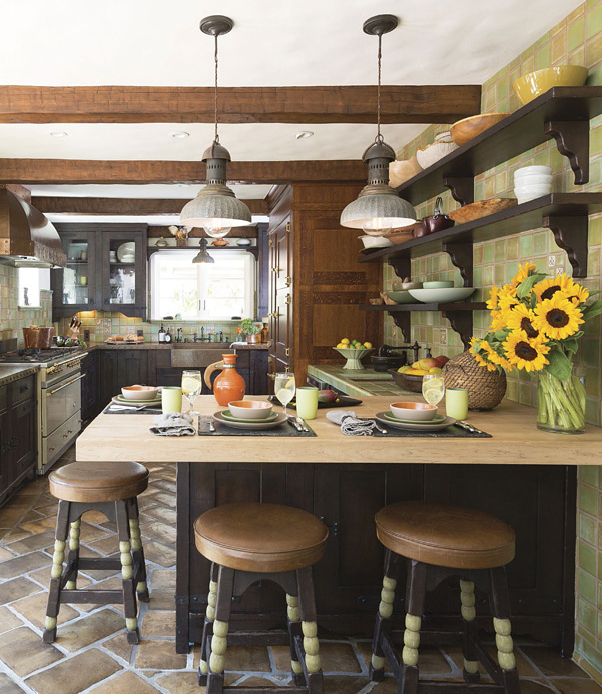 This gorgeous kitchen is filled with personality. Four kitchens as individual and filled with personality as the people who live in them. Contractor: Nar Fine Carpentry, Inc. The exhaust hood is flush with the ceiling and operates by remote control, Robery Abbey light fixture, induction cooktop, Custom Brasilica wood table with underlighting. The exhaust hood is flush with the ceiling and operates by remote control. Robert Abbey light fixture. Induction cooktop. Custom Brasilica wood table with underlighting. Awesome it is. Bustamante took down the wall between the small galley kitchen and the living room, creating one large space for cooking, entertaining and relaxing. 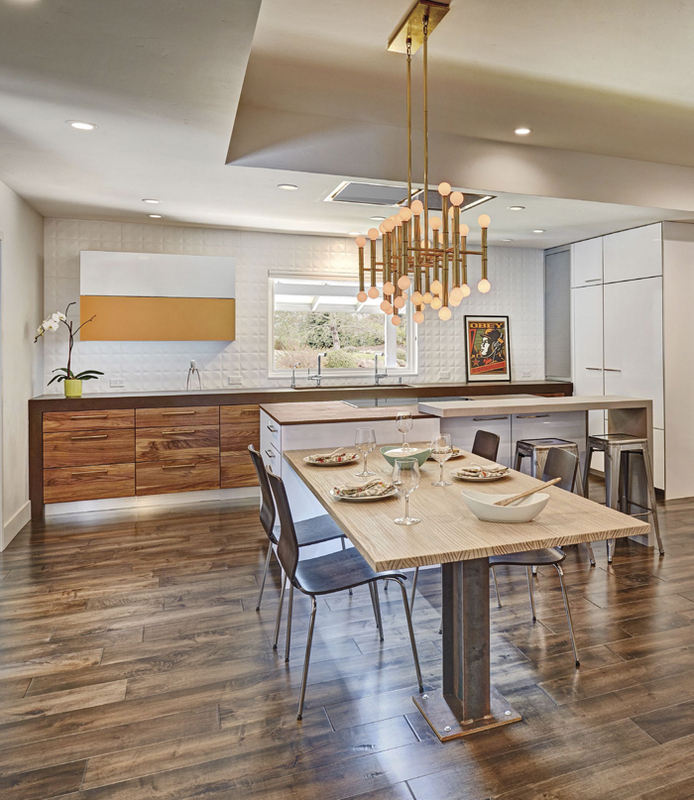 He opted for clean, modern materials: natural walnut for the flat-panel cabinets, high-gloss laminate for the island and Dekton (a sleek quartz product) for the countertops. Bustamante designed the custom cabinetry to look like furniture, using a mix of brass and chrome hardware and clever design features. 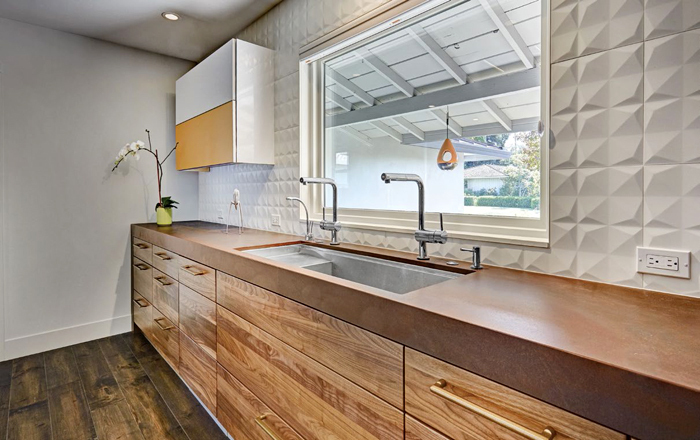 He wrapped the back wall of cabinets with Dekton in a waterfall design and added a 9-inch aluminum toe kick to give it the appearance of a 1950s credenza. He’s not fond of upper cabinets—“I don’t like to clobber them with cabinets,” he says—so the room has only one. Made of high-gloss laminate and back-painted glass, it’s got a hidden motor: Touch the bottom corner of the cabinet face and the door lifts up all by itself. Miles’ “absolute favorite” design element is the large-format, geometric white tile that covers the kitchen’s entire back wall. “It’s like a ‘2001’ Stanley Kubrick thing,” he says admiringly. A motor inside the cabinet allows it to open with a touch. Extra-wide stainless steel trough sink. A SMALL KITCHEN can live big, if you know the right tricks. 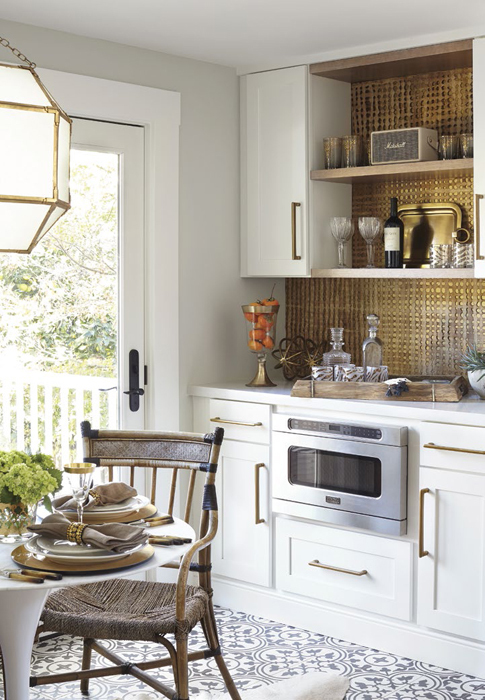 For the 2015 Napa Valley Showhouse, designers Rebecca Reynolds and Lori Gilder were tapped to take a tiny kitchen and turn it into a showstopper. The pair, who run a bicoastal design firm called Kitchen Design Network, weren’t allowed to change the existing footprint of the Napa bungalow. So they had to be clever to make the kitchen read and feel bigger than it actually is. They started by widening the tiny opening from the hallway to add light and to integrate the kitchen with the rest of the house. Then they added a French door leading out to the deck, which effectively expands the kitchen’s entertaining space. And they emphasized the kitchen’s lofty proportions with an interesting ceiling treatment, using quatrefoil ceiling medallions butting up to one another to create pattern and texture. 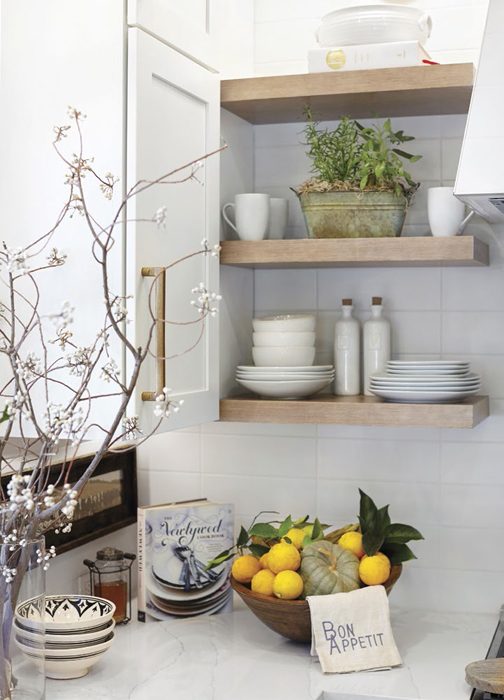 “There’s a lot you can do in a small kitchen,” says Gilder. White painted cabinets with a simple Shaker profile give the room clean, modern lines. 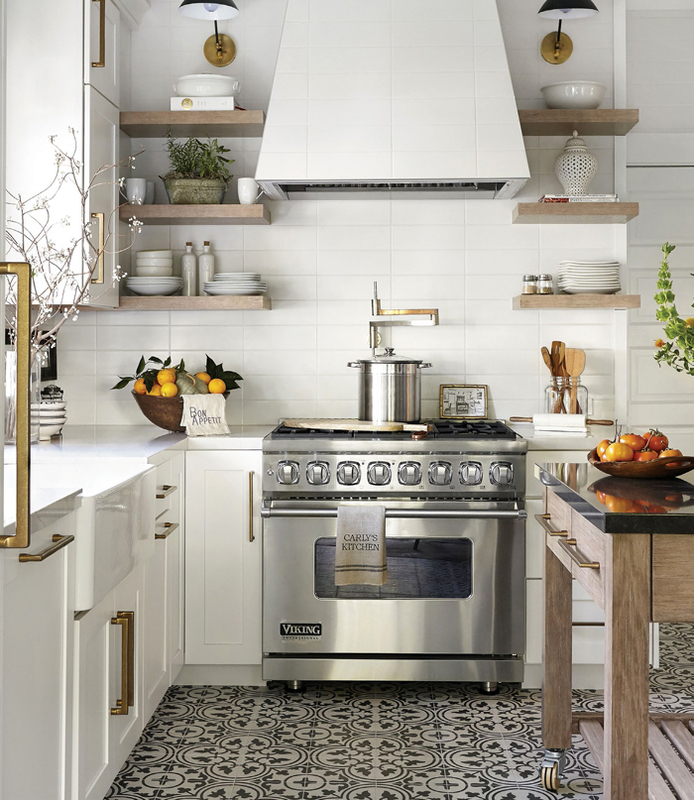 For the backsplash and exhaust hood, the designers laid white subway tile in a stacked pattern for a contemporary feel. 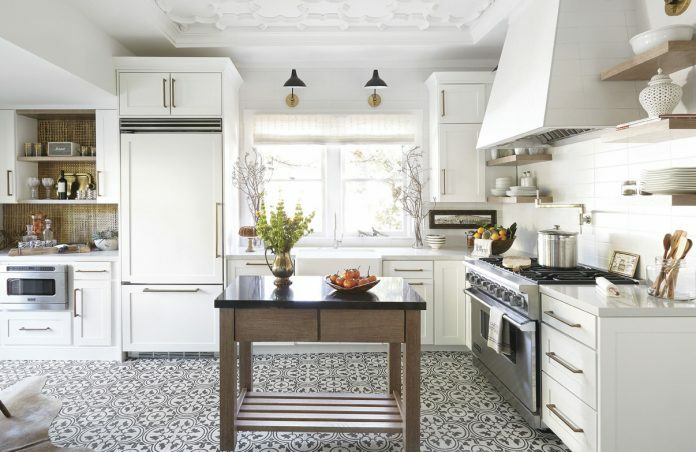 Encaustic cement floor tile in black and white is a classic that doesn’t look dated. 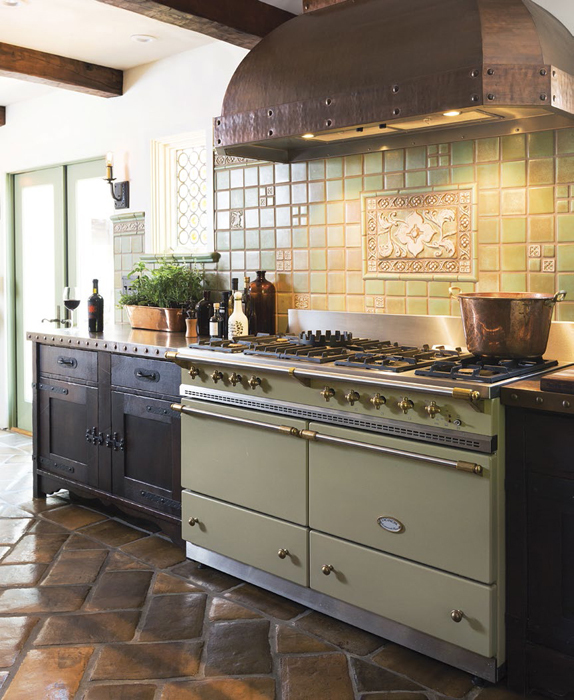 In all, the kitchen is a beautiful blend of old and new, vintage and modern. Suzanne Kasler’s Morris Lantern. Vintage dining chair from Ohmega Salvage in Berkeley. White painted cabinets with a simple Shaker profile give the room clean, modern lines. Then they added a French door leading out to the deck, which effectively expands the kitchen’s entertaining space. And they emphasized the kitchen’s lofty proportions with an interesting ceiling treatment, using quatrefoil ceiling medallions butting up to one another to create pattern and texture. Custom copper sink, open shelves for display and maple butcher block. 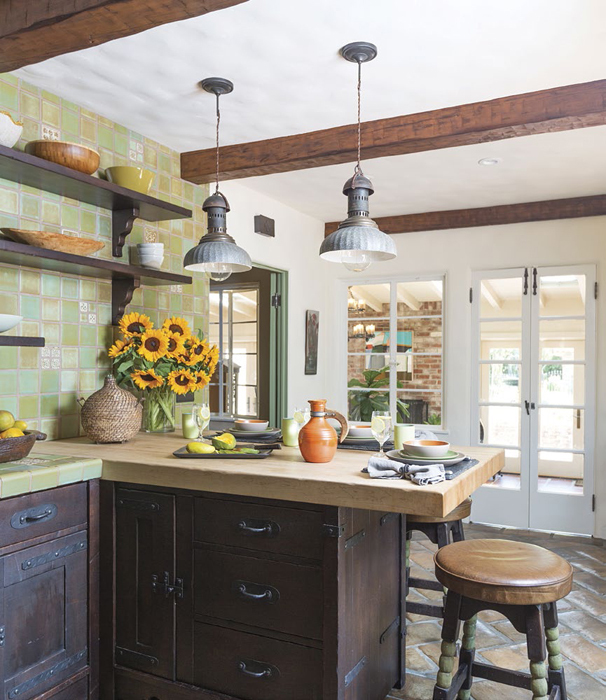 Custom alder cabinets with hand-forged iron hardware were fabricated in Southern California by Warren Hile Studio, which is known for its high-quality Craftsman and Mission furniture. Decorative details include new alder wood beams (to match those throughout the house) and vintage Italian streetlights that were repurposed as pendants for over the island and sink. A FEW YEARS AGO, Melissa Conner and Ted Harris bought one of the finest old homes on one of the finest old streets in Sacramento: a late-1920s Spanish-style house on Crocker Road, built by Squeaky Williams. But as with many houses of its era, the kitchen was seriously undersized. Conner and Harris wanted a kitchen befitting their grand old home. So they turned for help to Michelle Sekula, an interior designer and antiques dealer who shares their love of early California design. A beautiful Lacanche Range in a remodeled kitchen. Blue Star Cooktop in a cook's kitchen. This kitchen remodel was for a person who loves to cook and wanted a kitchen that was as hardworking as it was attractive. “THIS IS A PERSON who uses her kitchen.” That’s how designer Leyla Jaworski describes her client, Folsom resident Susan Mentink. Jaworski has seen her share of “show kitchens” designed just to impress. But that simply wouldn’t do for Mentink, who loves to cook and wanted a kitchen that was as hardworking as it was attractive. Jaworski succeeded on both scores. 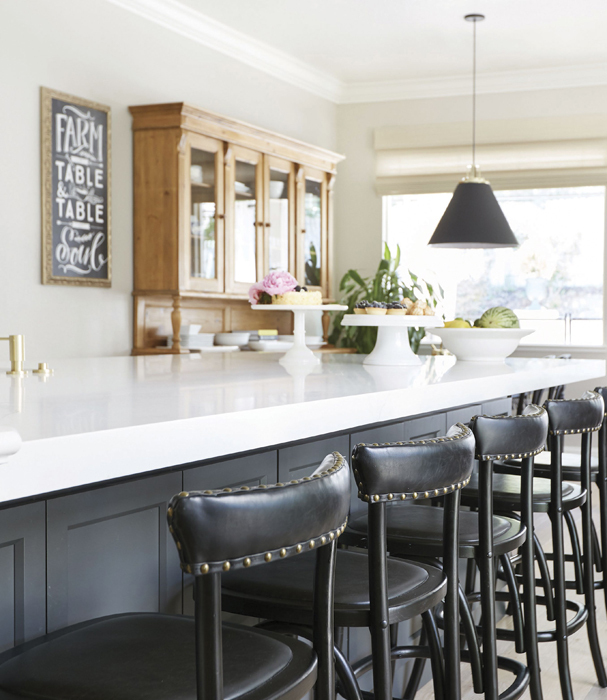 The kitchen has more than a soupçon of French bistro style, from the wire-brushed, oil-rubbed French oak flooring to the classic brass sconces and clean-lined brass drawer pulls. 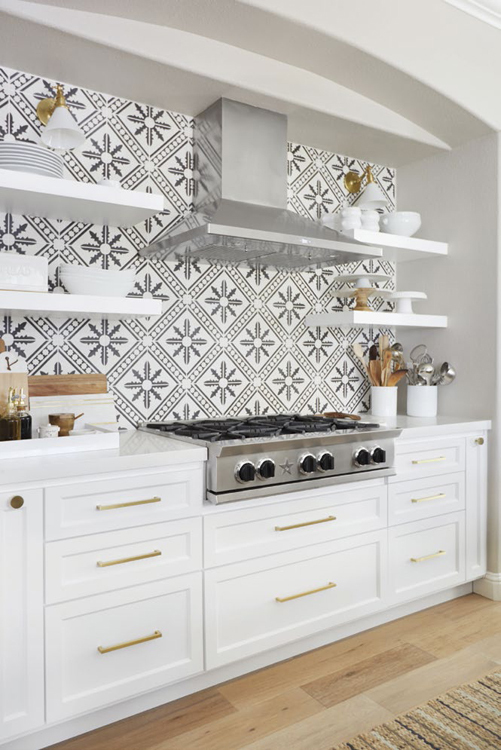 A major focal point of the room is the cooking niche with its backsplash of graphic black-and-white cement tile. Floating shelves give Mentink easy access to frequently used items and allow her to display her collection of cake stands and whitewares. Sequel quartz countertop that mimics Calacatta marble. 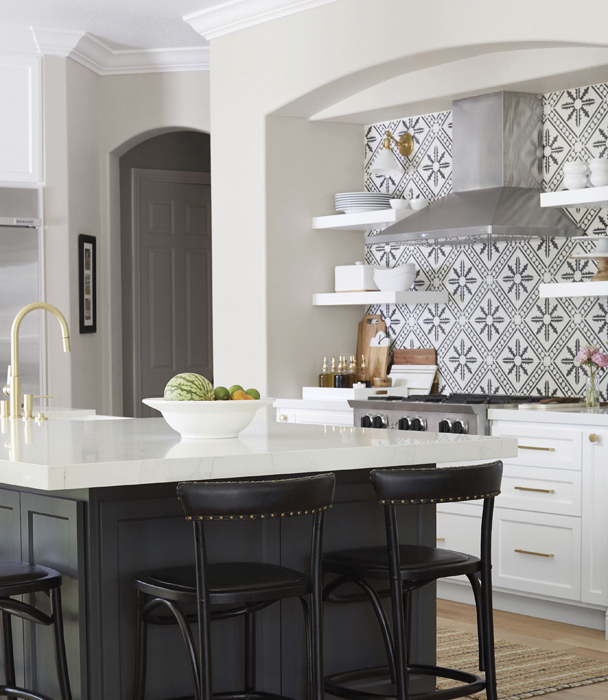 To avoid the cliché of the all-white kitchen, Jaworski persuaded her client to paint the island a handsome charcoal gray. This Schoolhouse Electric sconce, Newport Brass faucet, cement tile backsplash from Cement Tile Shop. Lucas barstool from Pottery Barn. The kitchen has more than a soupçon of French bistro style, from the wire-brushed, oil-rubbed French oak flooring to the classic brass sconces and clean-lined brass drawer pulls. A major focal point of the room is the cooking niche with its backsplash of graphic black-and-white cement tile. 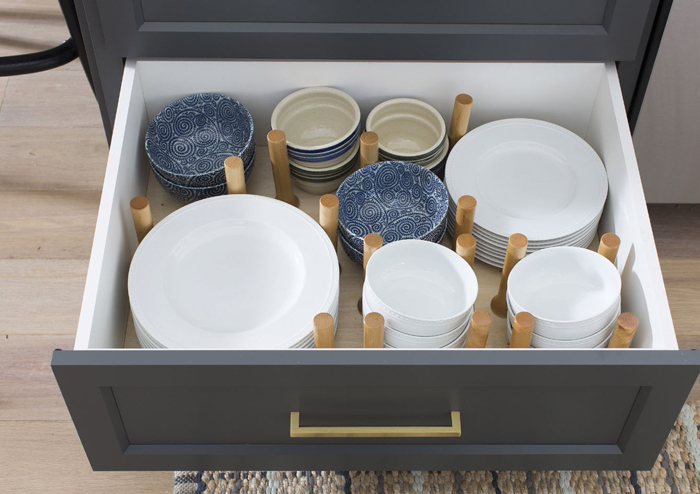 Dishes are stored in an island drawer.